Auggie was adopted by Manoo and her family in 2015 and she says he is a happy go-lucky dog. 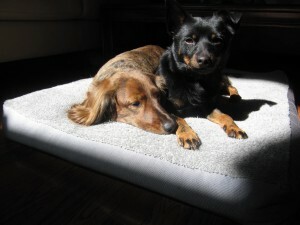 He loves his sister Moxie (long hair standard Dachshund). They play all the time and are now inseparable. “I have taken Auggie to basic obedience classes and he did good there. He is still a work in progress as he gets very excited when going for a walk and pulls on his leash but he is working on that. At the beginning he didn’t know what playing is but soon he started warming up to the idea and now he even invents his on games. I must say for a dog who had spent all his life in a shelter and did not have much interaction with humans or dogs, is doing fine and getting better day by day! He is an absolute cuddle bug and loves and demands attention. We feel very lucky to have him in our family and cannot imagine life without him. Thank you Minpinerie for all you do and for bringing us together.” So nice to see friends enjoying life! !